The core of this endeavour addresses and narrates a journey back in time to the lores and myths of the rural surroundings of his early life. Mukesh has carried with him one particular image from the cycle of myths- the image of the great serpent Naga representing ever flowing time. Naga connects the earth and the heavens, the mortals and the celestial worlds. His serpent is a design to represent the aeonic time which exists between the timeless world of ideas and the time-bound perishable world of the present. 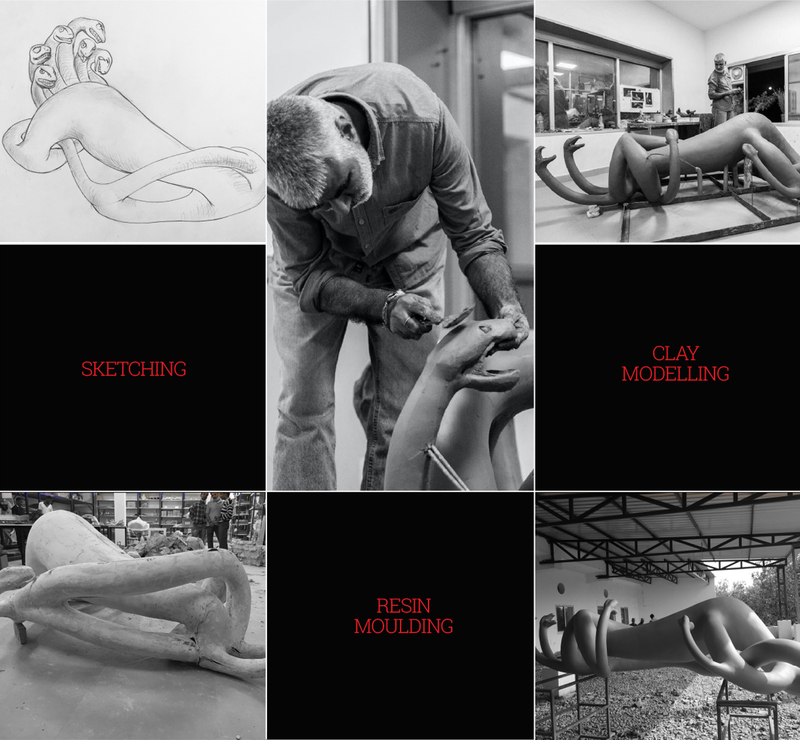 The multi headed serpent otherwise defies the organisation and linearity of a natural creature leading back to the chaos of early forms of creation. The entanglement and lack of physical direction with aggressive posturing somehow represent the angst of techno material reality of contemporary time. Thus Naga transpose to a spatial design of urban dream with distant memory of the past. The core of this endevour addresses and narrates a journey back in time to the lores and myths of the rural surroundings of his early life. Mukesh has carried with him one particular image from the cycle of myths- the image of the great serpent Naga representing ever flowing time. Naga connects the earth and the heavens, the mortals and the celestial worlds. His serpent is a design to represent the aeonic time which exists between the timeless world of ideas and the time-bound perishable world of the present. 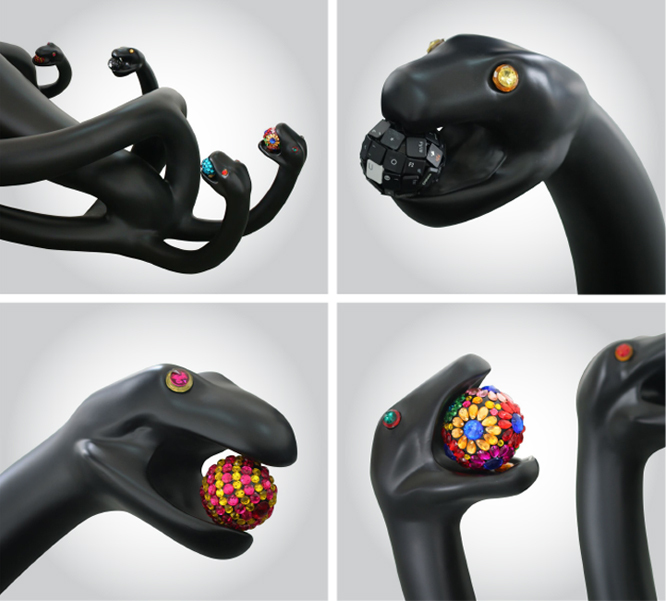 The multi headed serpant otherwise defies the organisation and linearity of a natural creature leading back to the chaos of early forms of creation. The entanglement and lack of physical direction with aggressive posturing somehow represent the angst of techno material reality of contemporary time. Thus Naga transpose to a spatial design of urban dream with distant memory of the past. 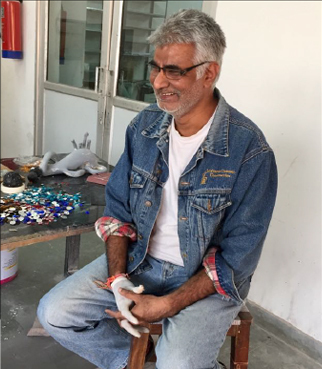 Taking a leap into master craftsmanship Bent Chair has collaborated with established Indian artist Mukesh Sharma, an expertise in art who has exhibited in various spaces across the world which has added magnitude to his expression. The virtuosity and multitude of Mukesh cannot be captured in a few words. 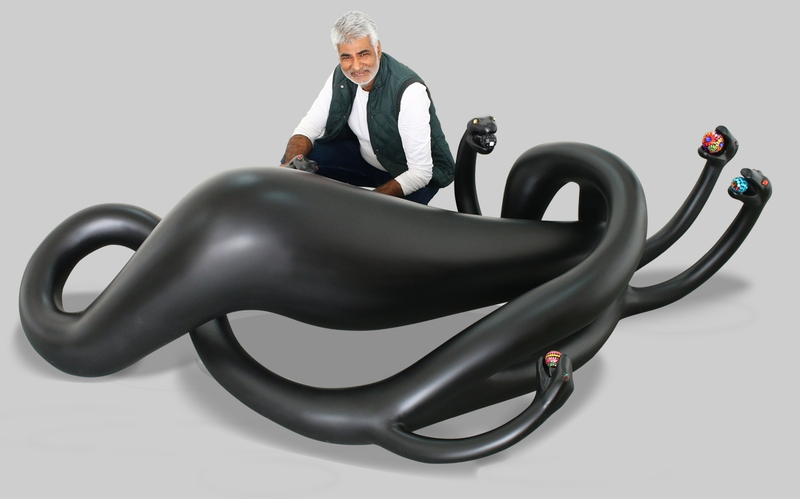 The Naga is a 7 ft long resin sculpture which has been created at Bent Chair in collaboration with the famous Indian artist Mukesh Sharma.The first preview of this will be at the Luxury Symposium 2018 on the 30th November 2018 at the Hyatt Regency Hotel, New Delhi.This extraordinary installation has been named " Nagadhiraj" by our Hon'ble Minister, Smt. Sushma Swaraj.